Want to know where I will be this weekend? Nothing on the books other than signing up the Boom for a weekend of S.H.I.E.L.D. Training. Check out this KidsTrack! 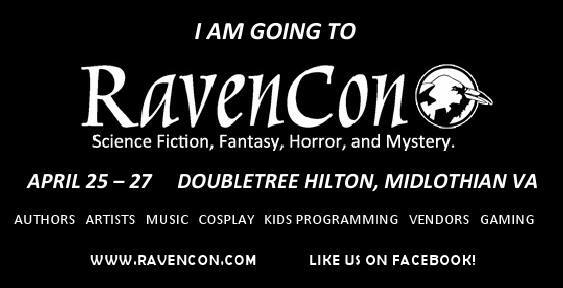 I have a feeling we will be politely blown off for the entire time we are at RavenCon this weekend. UPDATE: I will be judging (or joining — still not too sure what I’m getting into) the Midnight Reading of The Eye of Argon. Check your con schedule for details! Doctor Who Through the Ages, 9 a.m.
A Reading from The Diamond Conspiracy: A Ministry of Peculiar Occurrences Novel, Boardroom, 11 a.m.
Spy Themes (or Why I Want to Visit Portmeirion), 6 p.m. Comedy in SF/F, 9 a.m.
Don’t be shy! Bring your books to panels (or our reading), introduce yourself, say “Hi” and by all means join Pip and myself for what promises to be a great weekend in Richmond. We hope to see you there! I am pretty sure you’ll see me Saturday at 9 AM. I’ll probably be sitting next to you.